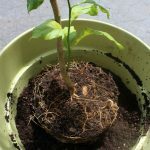 Can I take new growth at the base of a young lemon tree and start a new tree? How do you do this? I purchased a lemon tree this yr. I planted it in the ground and it seems to be doing well, approx 3' high. There is new growth at the base of the tree...2 new sprouts. I would like to cut this new growth off and start 2 more trees. How do I do this correctly? Thank you. Your tree is likely grafted. The suckers that grow from the base are likely coming from the root stock. This root stock is citrus but you will not be able to determine what kind of citrus. Whether you try to root these or not, remove them quickly from the base of the tree.